Niagara Region is investing in tomorrow to make sure we have the infrastructure to serve current and future residents and businesses in Niagara. A Schedule 'C' Class Environmental Assessment is underway to plan for a new wastewater treatment plant and improvements to wastewater systems in the South Niagara Falls area. The new plant and system upgrades will meet growing needs and provide environmental benefits to the South Niagara Falls area. The public, stakeholders and agencies will be consulted and engaged through each step. We undertook an integrated process called Niagara 2041 where the Region looked at water and wastewater infrastructure, growth planning and transportation to establish a plan for Niagara's future. It identified significant opportunity for growth in the South Niagara Falls area. Under this process, the 2016 Water and Wastewater Master Servicing Plan Update was completed. 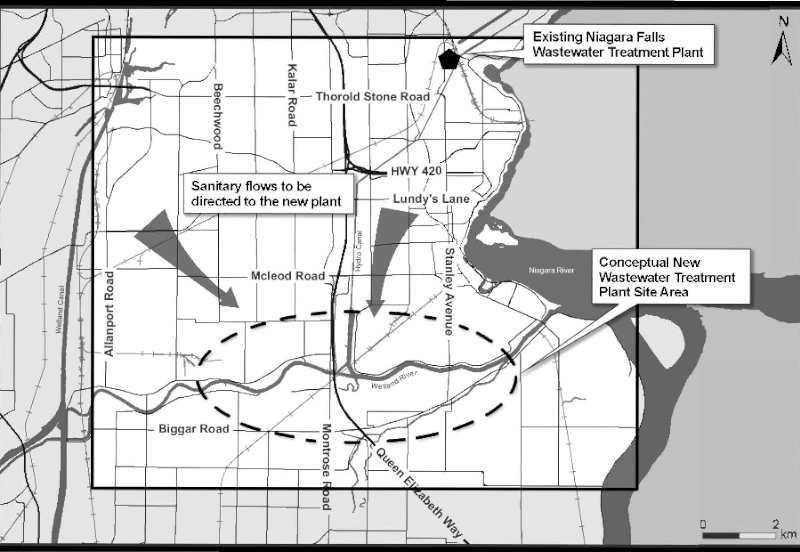 A key recommendation was to establish a new wastewater treatment plant in the South Niagara Falls area and have the sewer systems in the southern area connect to this new facility. Niagara Region Council and Niagara Falls Council adopted these recommendations in 2017. When you flush a toilet, take a shower or do laundry, wastewater flows into the sanitary sewer system to one of our wastewater treatment facilities. Wastewater can also come from industries, commercial businesses and institutions. Wastewater is water that has been used in a way that negatively impacts its quality. Contaminants in wastewater typically include human waste, oils, grease, chemicals, dirt and soaps. Wastewater from across Niagara is collected and flows into the underground sanitary sewers connected to homes, businesses and institutions. It then flows to a facility where it goes through a multi-step treatment process to prepare it to be safely returned to the environment. At the facility, solids are removed and the wastewater is purified to meet set standards. Once fully treated, it's discharged through an 'outfall' into a deep enough nearby natural body of water. A Municipal Schedule 'C' Class Environmental Assessment is a five-phase study that identifies potential positive and negative effects of projects such as road improvements, facility expansions, or to facilitate a new service. The process includes an evaluation of impacts on the natural and social environment, including the impacts to plants, animals, soils, traffic patterns, and to residents and businesses in the community. The full assessment will take approximately two years to complete. However, the preferred site location is anticipated to be selected by fall 2019. As the region grows and builds new communities, creates new jobs, and invests in new facilities like schools and hospitals, investment is needed to plan and build our infrastructure, including having what we need to treat wastewater. There is significant residential and employment growth planned for Niagara and specifically for the South Niagara falls area. Of the total growth (employment and population) expected in Niagara Falls by 2041, 64 per cent of that growth is expected in South Niagara Falls area. This area will require a new wastewater treatment plant and upgrading our sewer system to support this growth and protect the environment. Sign up to receive updates on this project. Thank you, we have received your request to be notified about updates for the South Niagara Falls Wastewater Solutions project. Thank you, we have received your feedback for the South Niagara Falls Wastewater Solutions project.